Did you know that tomatoes can also show up in colors like black, purple, brown, yellow, pink, and white? But wait, there's more! Some favorites are the bi-colored and striped varieties. They're the party favors of the tomato world and once you've grown these festive fruits, your garden (and kitchen) will never be the same. 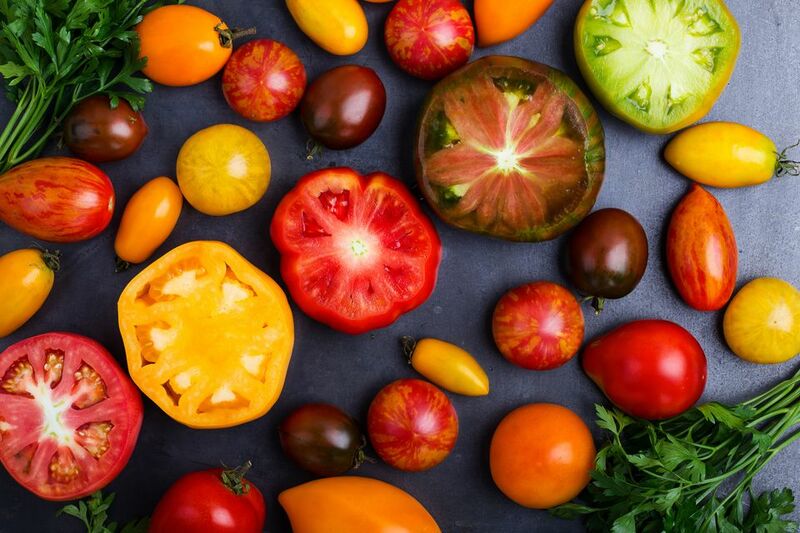 For gardeners looking for some different (and delicious) varieties to try, here's a sample list of open-pollinated and heirloom tomatoes that show up with surprising colors and patterns. The produce section in the grocery store will never be able to compete with these heritage beauties. You'll boost your chances of tomato success by planting them in soil that's loaded with organic matter and making sure that the variety you choose does well in your area (or at least doesn't hate it). Check the "days to harvest" to be sure that the plants will receive enough days of heat to produce well for you. Specific guidance can be found at the seed company that you're purchasing your seeds from or contact your Cooperative Extension Office. Beauty King - These are beautiful tomatoes that have clearly defined red- and yellow-striped fruit. The flavor is fruity and sweet. Beauty Queen - Beauty Queen is a prolific producer of small-to-medium-size tomatoes that have clearly defined red and yellow stripes. Terrific flavor. Big Rainbow - These 2-pound tomatoes have green shoulders, a yellow midsection, and neon red streaks running through them. Terrific slicing variety. Mr. Stripey - This beefsteak type tomato is low in acid so offers mild flavor in a meaty fruit. Its base color is yellow and has red streaks. Copia - This newer open-pollinated variety that's an extremely unique-looking tomato. The skin has fine striping of brilliant gold and neon red. The flesh is swirled red and yellow. It's juicy and flavorful. Csikos Botermo - Here's a sweet, cluster tomato that has lovely yellow stripes on red skin. It's rare and colorful. Black Krim - This juicy, medium-to-large fruit hails from the Isle of Krim in the Black Sea. It's a deep purple with green shoulders and has a rich and tangy flavor. Gajo De Melon - These little pink and yellow marbled cherry tomatoes taste like tomato, melon, and sugar stirred together. Georgia Streak - This 2 pound, Georgia heirloom is a big beefsteak-type with yellow and red flesh. Its skin is yellow with a red blush. It has a nice flavor. Gold Medal - This gorgeous variety is predominately yellow but has a rose blush radiating up from the blossom end of the fruit. It's mild and sweet with very little acid. Makes a great slicing tomato. Green Zebra - A favorite chef's variety that's extremely striking in color with yellow-gold skin and stripes of lime green. It has a rich, sweet flavor that gives just a little bite - excellent taste. HillBilly (Flame) - This is a 4" - 6", yellow, flattened fruit with rose "flames" on its skin and throughout the flesh. It's been described as meaty, creamy, rich, and sweet. It's also crack-resistant and makes a gorgeous slicing tomato. Isis Candy Cherry -This is a sweet and fruity cherry tomato that comes in different shades with blushed patterns on them. Usually, they have a "cat's eye" at the blossom end. Marizol Gold - This German heirloom from the 1800s. These are flattened, deeply ribbed, red and gold bicolor tomatoes. It's a prolific producer with delicious flavor. Mary Robinson's German Bicolor - This is a large, yellow fruit that with lots of red shading and stripes. It's sweet and mild in flavor. Nature's Riddle -This Russian tomato is golden-yellow with salmon-pink streaks and blushes. It's sweet-flavored with a meaty texture. Old German - Southern Exposure Seed Exchange introduced this Mennonite family heirloom in 1985. It has outstanding flavor and its color is yellow with a red center through the whole tomato. The fruits often weigh more than a pound. Pineapple - This 2-pound tomato is beautiful to serve with its yellow skin and red marbling. It has a sweet and fruity flavor. Plum Tigris - These 4-ounce fruits are plum-shaped and have unusual bright red and yellow stripes. It has good flavor. Red Zebra - This is Green Zebra in a fire-engine-red dress with bright yellow stripes. It's a sweet tomato full of flavor. Striped Cavern (Schimmeig Stoo) - These fruits are shaped like a bell pepper and have red skin with vibrant yellow stripes. Great stuffing tomato (try it with cheese). Striped Roman (Speckled Roman) - Striped Roman is an amazing-looking variety that you'll never recognize as a tomato. The fruit’s unique shape is cylindrical, 3" x 5" long, and pointy. Their base color is red, but they have wavy yellow stripes. It's a meaty and excellent-flavored tomato. Tigerella - These 2" round tomatoes are a popular variety from England. It's an early producer and very prolific even in cool summer areas. Tigerella is dressed in bright red with orange stripes and is disease-resistant. Turkish Striped Monastery - This 2" variety is striped red and gold, has great flavor, and is a high producer. Williams Striped - Williams Striped is a 1 pound, beautiful tomato with skin and flesh colors of red and white. The large fruits have luscious flavor. All of these striped and bi-colored tomatoes are either heirlooms or open-pollinated varieties, so remember that you can save their seeds to be replanted the following year -- and every year after.